Kicking the can down the road is a familiar way to avoid dealing with a problem. That is what happened in the Trump-Kim talks in Singapore on denuclearization, and it just happened again in the Trump-Xi trade talks in Buenos Aires. The positive side of kicking the can is that it defuses tensions, but the negative side often outweighs the positive: the basic problem is not resolved, expectations differ as to each side’s obligations, and the original problem is worsened and becomes intractable. 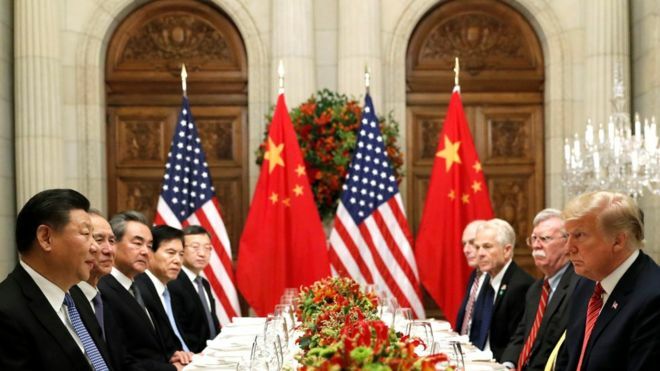 As various news reports have pointed out, the US side in the trade talks with China imposed a 90-day deadline for China to carry out supposed concessions, including reducing and removing tariffs on US auto imports, making large new purchases of other US products, and making structural changes in the way China handles technology transfers and industrial espionage. The Trump administration will go ahead with raising tariffs on some $200 billion in Chinese exports if Xi fails to follow through on what Trump believes were his commitments at the summit. Did Xi actually make those commitments? Today’s news reports here don’t tell us what the Chinese actually are saying about the trade summit. When I looked at the December 3 People’s Daily, the official newspaper, I found (predictably, as most any China specialist would expect) a very different “take” on what was discussed and agreed upon. Note, moreover, in the excerpts below how the Chinese report frames the subject matter with principles: mutual gain, mutual respect, mutual responsibility. To the Chinese, principles are central to doing business, whereas to the Americans (and especially Trump) details of the deal are all that count. Note also the Chinese emphasis on eliminating further US tariffs rather than on commitments to changing commercial policies. To be sure, reporting on the trade summit in the Chinese press must be sensitive to nationalist feelings, and must therefore avoid any suggestion that Xi Jinping caved in to US pressure. Still, these initial articles probably accurately reflect the Chinese leadership’s perspective. Don’t, therefore, expect the US-China commercial dispute to improve significantly anytime soon. More likely, Trump’s trade war will resume next year, worsening the already unstable state of US-China relations. Here are excerpts from two articles I have translated from People’s Daily. The first reports directly from what Xi Jinping said, whereas the second is more of a news article. There’s little substantive distinction; the thrust of both articles is the same, as one would expect. Thank You Mel! Interesting but not a surprise! I’m certain Don had a full grasp of the agreements reached and he truly believes that these agreements will be viewed by trade scholars as the most significant in history.